Our goal is to find loving, healthy, happy homes for all Boxers! Due to the increasing amount of dogs overpopulating all of Manitoba, I am no longer going to take ANY dogs with aggression/behavioural issues. I am going to try and help people rehome their pets when they are unable to keep them. This was the original purpose of my rescue and now the term “rescue” means save everything. However that is just not possible for my rescue to maintain. There will be exceptions I am sure but on a individual basis I will determine if I can help the dog or not. I am the only person taking care of intake, adoptions and home visits. Please be patient as I have a regular job and have my own dogs to care for. Your application will be sent to Winnipeg Boxer Rescue , once rec’vd I will contact you for further information and to arrange a home visit if I feel you are a good candidate at that time for a specific dog. All applications will remain active for 6 mths, then you must re-apply. Foster applications may be required for each individual dog that you want to foster. We do however do our best to find wonderful homes for the Boxers that are in need. Patience is required when you are planning on adopting a Boxer that is in rescue…..we have no way of knowing when they are going to come into the rescue. Adoptions are donations used to cover all medical costs for all dogs in my care. All dogs are spayed/neutered, all shots are up to date, dewormed (if needed), tattooed, and each dog is heartworm tested. Heartworm medication is given while dogs are in rescue. Once adopted the new owner is responsible to purchase the remaining heartworm medication. Many other medical issues may arise when a dog comes into rescue and we do our best to address each and everyone, we will go above and beyond the routine care that is promised when ever possible. As the director I look after all vet bills myself and try and recoup some of them with adoption donations and fundraisers. The adoption costs are based on vetting of dogs, however there are some exceptions. All donations over the vet costs are used for other dogs who may require a higher amount of medical care. 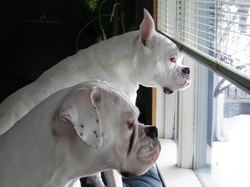 White Boxers are not albinos and their colouration is not the result of a genetic mutation. In Boxers, white is just a color. But white dogs tend to burn in the sun and may be at increased risk of skin cancer. People that just want to breed their dogs for fun, money or to have another puppy should know that Rescues will always have dogs for adoption! We reserve the right to change the adoption donations on each dog.